North Korean Foreign Minister Ri Yong-ho arrived in Tehran for talks on Tuesday, the same day U.S. President Donald Trump imposed fresh economic sanctions on Iran after backing out of a nuclear deal. Both North Korea and Iran face tough sanctions over their nuclear weapons development, though Iran has gone much further toward verifiable denuclearization. 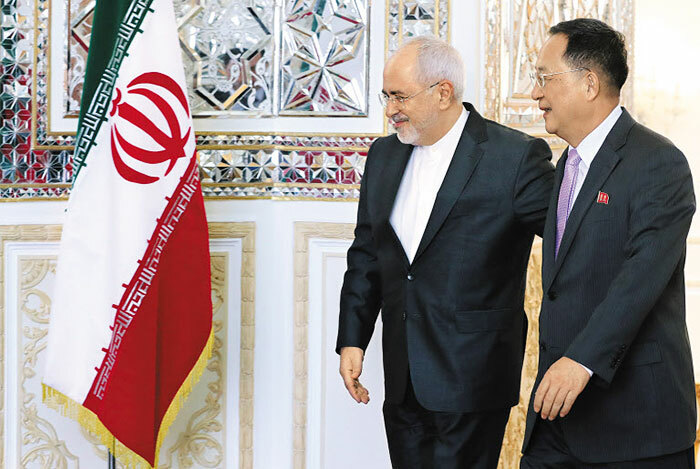 The official Fars News Agency only said that Ri sat down for talks with his Iranian counterpart Mohammad Javad Zarif to discuss bilateral relations and Middle-Eastern issues. But there could be more important matters on the table. "Currently, the two countries are in the same boat as far as U.S. sanctions are concerned," a diplomatic source said. "They'll try to send a message that they won't give in to U.S. pressure while calling for further developing their long-standing friendly relationship." Pyongyang established a close relationship with Tehran by supplying arms during the Iran-Iraq War between 1980 and 1988. Since then, Pyongyang has been suspected of exchanging nuclear weapons and missile technologies with Tehran. Pyongyang's dispatch of its chief diplomat to one of the world's largest oil-producing countries comes at a time when it has difficulties importing oil. The UN Security Council has capped exports of refined oil products to North Korea at 500,000 barrels and crude oil to 4 million barrels a year. Pyongyang is seeking to diversify oil import sources as the international watch dragnet is closing in. "Iran has a surplus of oil but can't sell much in the face of U.S. sanctions," a researcher with a government-funded think tank here said. "There's a likelihood that the North will discuss with Iran ways to import the Iranian oil stealthily through a third country like China."